New for 2015, the Blacktop and Ralleye Appearance Package are available on more models, while the Dr. Dre Beats audio system is standard on R/T and Citadel levels, and available on the Limited level. There are three available engine options that you can equip your Durango with; two V-6 options and one V-8. The V-6 options include a 3.6-liter V-6 engine (on the SXT, Limited) with 290 horsepower, and the second V-6 is also a 3.6-liter with 295 horsepower on the Blacktop, Ralleye, and Citadel packages. Finally, the V-8 engine is a 5.7-liter which produces 360 horsepower. All of the above engines are mated to the eight-speed TorqueFlite automatic transmission, and there is a 7,400 pound towing maximum. Some great features include steering-wheel-mounted paddle shifters and a capless fuel filler. Also available is a trailer hitch receiver, for ease in towing. The interior is beautifully designed, with a three-spoke steering wheel positioned just in front of a 7-inch LCD screen instrument cluster. With a couple Uconnect multimedia options, either the standard 5-inch and available 8.4-inch touch-screen which keeps you connected yet hands-free on the road. Available is a great Blu-ray and DVD entertainment system, to keep your passengers entertained during your travels. The exterior is beautiful with a powerful, dramatic and stylish design. Featured are projector beam headlights, 18- or 2-inch wheels, rear window wiper and defroster, rear window wiper and defroster, high-intensity-discharge headlights. Finally, there is an optional power sunroof. 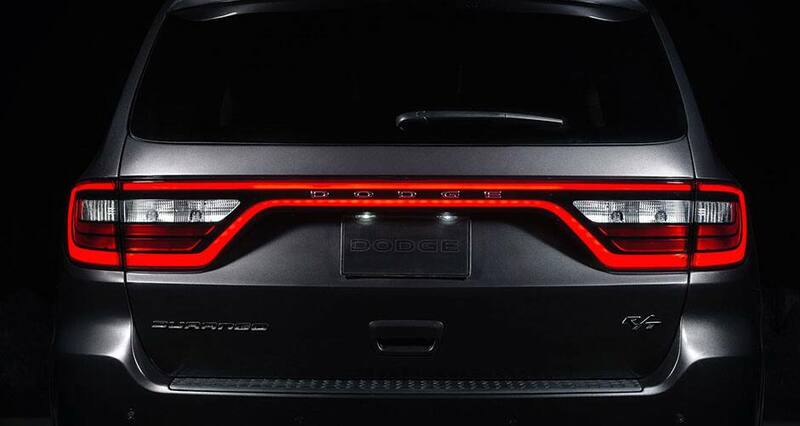 Have a question about the incredible Dodge Durango? Give us a call, or fill out the form below, and we would be happy to discuss the great 2015 model with you!